Higher Science of the Motion of Matter. 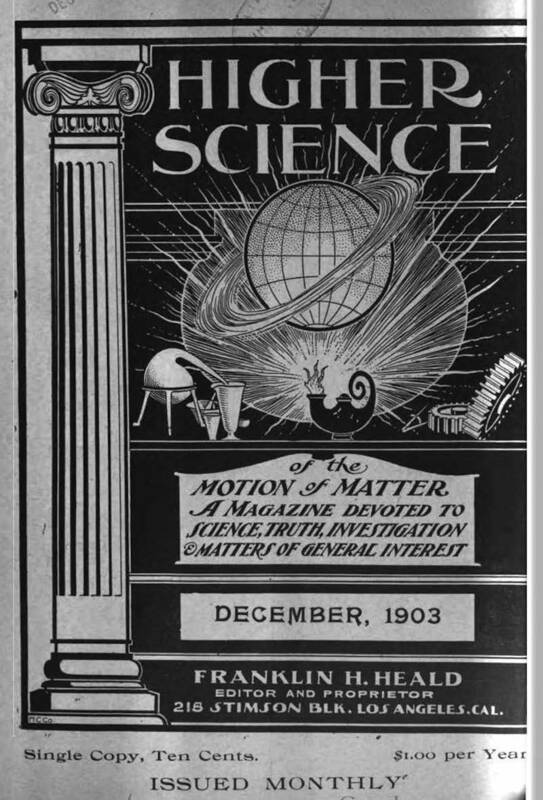 A Magazine Devoted to Science, Truth, Investigation and Matters of General Interest. Los Angles, CA. Editor: Franklin H. Heald, editor and proprietor. 1/1, December 1900. $1.00 a year. Advertised in The Mountain Pine, 1907 and 1908, and in The Adept, February 1911, and noted in H.O. Severance, A Guide to the Current Periodicals and Serials of the United States (1909). An advertisement for the journal in the Adept offered as a premium with each subscription a turquoise (1 to 3 1/2 carats) from Heald's own mine. He was a wealthy and idiosyncratic man whose goal was to convince the world of Newton's errors about gravity and to show the regular progression of the planets from the periphery towards the sun. He combined these with an interest in New Thought.